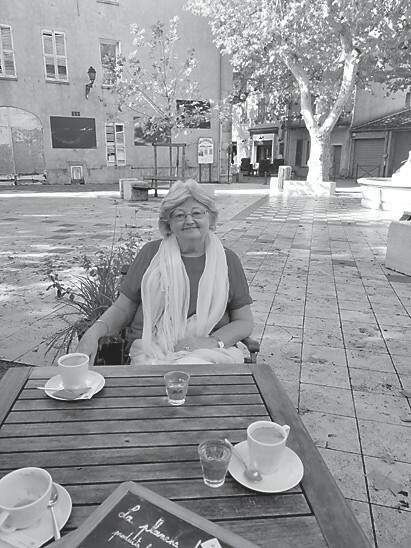 Pictured is Jo Waugh, an Englishwoman whom Gwen Johnson met in France. Go to our Facebook pages for announcements and pictures posted after each event, www.facebook.com/ pages/Hemphill-Community Center or www.facebook.com/Hemphillblacksheep. In my travels I met a delightful lady from England who spends part of each year in France. Her name is Jo Waugh. We spent lots of time talking about food. Jo lives about 20 miles from William Shakespeare’s hometown of Stratford upon Avon. I had never met an English cook before so I bombarded her with questions I had long wanted to ask. I asked her about something I had read about in Charles Dickens’s “A Christmas Carol”. It is the steamed Christmas pudding that Dickens said was “singing in the copper”. Jo smiled and said “Oh yes, the Christmas pudding”. John, her husband, acknowledged how good Jo’s Christmas pudding tastes. I found out the reason it is said to sing in the copper is because it is wrapped in cloth and steamed. The escaping steam causes it to make a noise when it escapes out the lid of the copper pot. Christmas pudding is an ancient tradition. It is a concoction sort of like modern day bread pudding containing plums, currants, figs, cherries, and other good things. It is sweetened with treacle (molasses). It is a heavy, wholesome dessert made with brandy. It is sometimes served with hard sauce, brandy butter, or boozy whipped cream. Another dish I had always been curious about was the English meat pie. Jo said she makes it in many forms. Beef, chicken, and veal are meats she uses most often. I thought about the wild game the hunters in our area often have. Once the meat pies were described I thought the recipe would lend itself well to cooking it with wild game. The meat pies are filled with onion, leeks, or shallots and these flavors are needed along with salt and pepper in order to cook wild meat and make it tasty. Jo was delighted to tell about this dish she said she was sure would be a big hit with coal miners and men doing hard labor. We were invited to Jo’s and John’s residence for dinner. Their residence is located in a building that functioned as a winery for centuries. She served us fresh cod cooked in a wonderful sauce along with parsnips, shallots, and potatoes. Dessert was her famous bread pudding. It was a wonderful meal eaten in the best of spirits, best of company, the best of hospitality, all along with good French wine. It was an awesome evening of delightful conversation. One important note I made in France and again when I ate the dessert cooked by this lovely Englishwoman was the lack of sweet sugary glazes. The desserts are more wholesome. They have great flavor without the overkill of sugar we eat in America. Fruit is a main ingredient in many desserts served there. The natural sweetness is allowed to shine through by using less sugary sweetness. Sweet and tart… delicious!!! Don’t forget to come and hang out with us at the Center when you can. We have Wi-Fi now so kids and adults are better satisfied not being cut off from their electronic devices. We also have a playground and a walking track so bring the whole family and visit us. Black Sheep Bakery and Catering now accepts credit and debit card transactions — Visa, Master Card, Discover, and American Express. We are making progress!!! Nov. 8: Black Sheep Bakery opens at 4:30 p.m.
Nov. 9: Black Sheep Bakery opens at 4:30 p.m.
Friday Night Pickin’ with Ronnie Dale and His Band at 7:30 p.m.
Nov. 10: Black Sheep Bakery opens at 4:30 p.m.
Nov. 13: Senior Fellowship 10 a.m.
Nov. 15: Black Sheep Bakery opens at 4:30 p.m.
Nov. 16: Black Sheep Bakery opens at 4:30 p.m.
Nov. 17: Black Sheep Bakery opens at 4:30 p.m.
Nov. 20 : Senior Fellowship 10 a.m.
Nov. 23: Black Sheep Bakery opens at 4:30 p.m.
Friday Night Pickin’ with the Right Fork Ramblers 7:30 p.m.
Nov. 24: Black Sheep Bakery opens at 4:30 p.m.
Nov. 25: Shape Note Singing 2-5 p.m.
Nov. 27 : Senior Fellowship 10 a.m.
Nov. 29: Black Sheep Bakery opens at 4:30 p.m.
Nov. 30: Black Sheep Bakery opens at 4:30 p.m.
Friday Night Pickin with Sunrise Ridge at 7:30 p.m.
Inclement weather policy: Check our Facebook page for cancellations. Cancellations will be posted at least two hours before any scheduled events. For more information on events and catering: (971)-86-SHEEP, (971) 867- 4337. Hemphill Community Center is located at the old Hemphill Grade School building at 2514 Hwy 317 Jackhorn, KY 41825.